Struggling with wounds that does not heal? Do you need to resolve problems with leg ulcers, fistulae or other skin damage? Special hyaluronic acid products deliver effective solutions. Initiate the healing! Sorelex is a wound dressing with complex effect and easy application. Efficiency of Sorelex has been proved in independent clinical studies. Sorelex combines multiple effects. 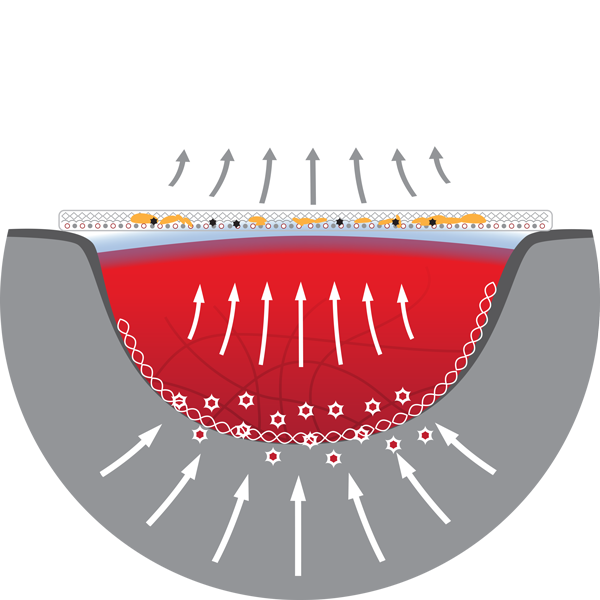 Bioactive hyaluronic acid accelerate growth of granulation tissue. Antimicrobial compound octenidine destroys bacteria, a specially designed grid layer removes impuritites. Sorelex also quickly reduces production of a wound exudate. Makes no difference, if you try to heal inflamed wound or clean wound. Sorelex can initiate the healing process in majority of non healing wounds. With Sorelex you can always be sure that you’ve made the right choice. 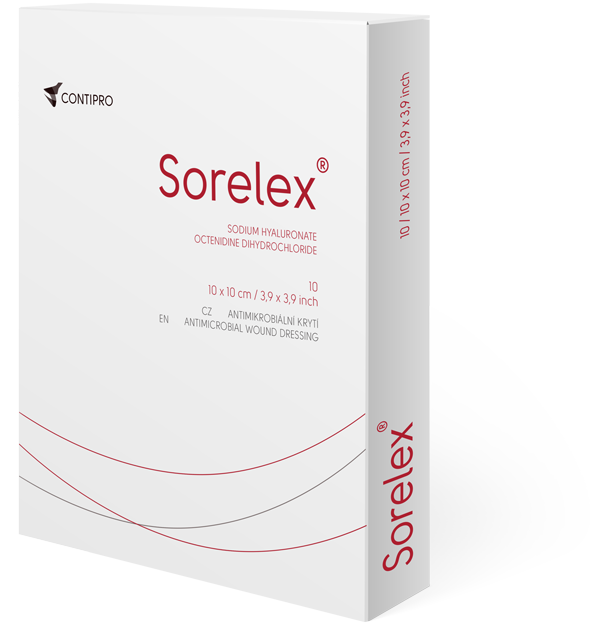 Sorelex is sutable for venous and diabetic ulcers, pressure ulcers, non-healing surgical wounds or wounds at risk of infection. Effect of Sorelex is mostly appreciated in wounds with moderate to high levels of exudate. Antimicrobial healing gel Hyiodine is the ideal answer for deepest, disintegrating and difficult to reach wounds. Moreover it contains bioactive hyaluronic acid, which makes the healing process much faster and easier. Using hyaluronic acid to heal wounds delivers reliable results in the regeneration of tissue. Iodine eradicates inflammation and prevents it from recurring. 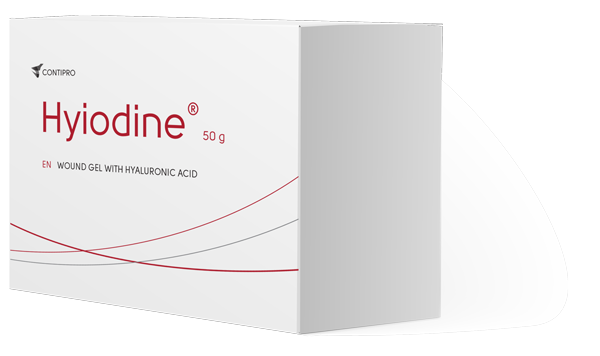 Hyiodine creates the ideal conditions for effective deep wound healing. The advantage of gel form is that it can be used in a variety of ways. Hyiodine eases the treatment of wounds affecting bone structure, wounds with exposed tendons, and deep fistulae. In a clinical study by Hradec Králové University Hospital, Hyiodine was shown to be highly beneficial in 68% of the most complicated cases. This is why an ever-increasing number of doctors rely on Hyiodine for wound healing. We all have hyaluronic acid in our body, as it helps us with tissue regeneration. The products based on this natural substance therefore are also effective in treating poorly healing wounds. Hyaluronic acid can regulate an excessive or overly mild inflammatory response and helps to control the correct progression of the healing process. Hyaluronic acid creates a natural environment in the wound for skin cells and attracts nourishing substances and growth factors. Hyaluronic acid stimulates the regeneration of new tissue and blood capillaries (angiogenesis) Quick start of the natural healing processes results in shortening of the overall healing time. As hyaluronic acid regulates collagen formation and storage, the new post-healing tissue is of a better quality, the skin is firmer and the scars are reduced. We are Czech biotechnological company with traditions back to 1990. We put emphasis on innovation and scientific progress. We are one of world leaders in the research and manufacture of hyaluronic acid for the pharmaceutical industry. Please contact Tomáš, our sales specialist. He will be happy to advise you and answer your questions about our products. © 2017 Contipro a.s.. All Rights Reserved.